Ideal for skiers and snorkelers looking for something tough and waterproof, this point-and-shoot camera is hamstrung by average photos and a short battery life. Phones like the Samsung Galaxy S9 and Sony Xperia XZ are water resistant, but would you take them skiing or snorkelling? Probably not, which is the gap in the market that Fujifilm is going for with its new XP130. An update on the XP120 and no bigger or heavier than the average pocket-sized compact, this is one well-protected camera. It’s waterproof to 20m, freeze-proof to -10C, and it can be dropped onto rock from 1.75m. There’s a 28-140mm zoom lens with a variable maximum aperture of f/3.9-4.9. It’s got a fixed 3-inch LCD display, but it’s no touchscreen functionality. There’s no viewfinder either. Although it has its good moments, the 16.4MP XP130 struggles in dull light, and has a short battery life of just 240 shots. In short, it’s not much more versatile than a smartphone…apart from in one key area; its tough physical design. You’ve got a hike planned, but bad weather is predicted. You’re going diving or snorkeling and want to take photos underwater. You’ve got a skiing or snowboarding trip, or fishing expedition, coming up soon. These are all scenarios that would suit a ‘tough’ camera like the XP130, which out-does both smartphones and most other cameras in the outdoor design department. It's perhaps most likely to be purchased for its waterproof prowess (it’s good for a depth of 20m), but an ability to work in temperatures as low as -10°C/14°F (most smartphones pack-up at 0°/32°F) makes the XP130 an option for ski trips, where it can easily fit in a pocket of a ski jacket or a pair of salopettes. Travel cameras should be lightweight, so the XP130’s chassis is impressively tough while remaining lightweight. The XP130 also looks the part, and for a rugged camera, that means armour. Not surprisingly, the XP130 has ruggedized grips on its corners, a large shutter button for easy access when underwater, and a garish white, blue, yellow, silver or lime color scheme. We’ve never been completely sure why so-called tough cameras feel the need for a look-at-me color scheme, but it's standard practice. So how does the XP130 differ from Fujifilm’s last tough snapper, the XP120? The main difference is an extra 5m of waterproofing; you can take it down to a depth of 20m / 65ft underwater. It’s got the same 16.4MP sensor (the 1/2.3-inch sensor is one of the smallest sensors going), 5x 28-140mm optical zoom lens, freeze-proofing down to -10°C / 14°F, and it can survive a drop from 1.75m / 5.8ft. It’s also got Bluetooth as well as Wi-Fi, for hooking-up to the free Fujifilm Camera Remote app for remote view and photos transfer. There’s no GPS, but that’s not necessarily a bad thing since such frippery can drain the battery fast. In its place, the app can use the location and time on your phone. 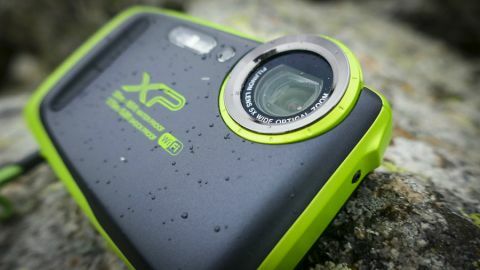 Since nobody wants to take their smartphone snorkelling, or on a hike up a mountain in the rain, the only real reason to buy a camera like the XP130 is for its tough credentials. Crucially, the XP130 comes in at cheaper than a GoPro Hero6 Black, and its 20m / 65ft depth capability makes this a good choice for hiking in bad weather, for kayaking, and for an occasional snorkelling trip. Whatever color you choose, in the box is a matching wrist-strap that’s critical if you’re near deep water. Sadly, the wireless compunctions settings failed far too often. Despite connecting an iPhone to the XP130's Wi-Fi network, and firing-up the Fujifilm Cam Remote app, consistently making a connection proved impossible. So-called rugged travel cameras like the XP130 should have big batteries that last all day. So why does the XP130 ship with a puny 700mAh battery? At least it recharges inside the camera via USB (or from a portable battery), but the few hours we got out of it just isn’t good enough for a long session of photography. What good is a ‘travel camera’ if you end the day using a phone anyway? The XP130 produces good, well saturated images in situations with plenty of light. For a day out hiking, kayaking, or cycling when you don't want to take a smartphone, the XP130 fills a niche. However, the image quality is pretty basic, and it never appears to reach the quality of a high-end smartphone. For instance, photos taken indoors tend to lack shadow detail, with black areas appearing blocky and noisy (even using the 'pro low-light' mode). Overall, there's a lack of ultimate detail even in exterior shots using the 16MP 'fine' JPEG is highest setting, with wide-angle, telephoto and macro shots all looking relatively soft. The HDR mode adds little but over-saturation to images, and is best avoided, as are many of the 'advanced' filters (sketch, toy camera, high key, pop and miniature) and film modes (chrome, black and white, and sepia), most of which are mere novelty. Talking of which, the Cinemagraph setting simply imitates the 'live view’ technique of taking a photograph that’s actually a three-second video. For landscapes there's a handy built-in electronic level, which is worth hunting for in the onscreen menus to add a little accuracy, while there's also a motion panorama mode that's operated by sweeping the camera through 360-degrees. However, not only is the process often interrupted half-way through, but the finished image is fairly small at just 1,088 pixels high. Sadly, the XP130 doesn’t shoot in raw either. Video recording is also a little basic. Though it's possible to record in maximum Full HD 1080p at 60p, recording is initiated by pressing a tiny button on the top. There’s also no external microphone connectivity, which is understandable for a camera of this size and cost, though the built-in mic is pretty poor. Overall, the XP130 offers average photos and videos, and should therefore be considered mostly for its environmental versatility. If the Fujifilm FinePix XP130 isn’t for you, we’ve picked three excellent alternatives for you to consider. Just announced, Panasonic’s successor to its Lumix TS5 (known at the FS5 outside the US) tough camera is waterproof to 31m / 102ft, freeze-proof to -10°C, drop-proof from 2m / 6.6ft, and pressure resistant to 100kg / 220lbf, but its headline act is surely a built-in 0.2-inch electronic viewfinder. It also increases the pixel count from 16.1MP in the FT5/TS5 to 20.4MP. However, it cannot shoot in raw, and its battery lasts for only 300 shots. It weighs 319g. While Panasonic has increased the pixel count of its tough camera, Olympus has gone the opposite way by reducing the 16MP of its aging Olympus Tough TG-4 to 12MP on its new TG-5 tough camera. Aperture is limited to f/3.9, but it does shoot in raw. On a tough compact camera, that’s rare. If you want to film your exploits as well, then you might want to consider an action camera like the brilliant GoPro Hero5 Black. Shooting buttery-smooth 4K video, it can also shoot 12MP raw files as well.